Newark Bay is a tidal bay at the confluence of the Passaic and Hackensack Rivers in northeastern New Jersey. It is home to the Port Newark-Elizabeth Marine Terminal, the largest container shipping facility in Port of New York and New Jersey, the third largest and one of the busiest in the United States. An estuary, it is periodically dredged to accommodate ocean-going ships. 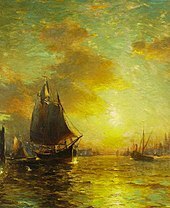 Upper New York Bay, or Upper Bay, is the traditional heart of the Port of New York and New Jersey, and often called New York Harbor. 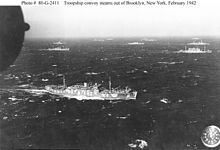 It is enclosed by the New York City boroughs of Manhattan, Brooklyn, and Staten Island and the Hudson County, New Jersey, municipalities of Jersey City and Bayonne. The Howland Hook Marine Terminal is a container port facility in the Port of New York and New Jersey located in northwestern Staten Island in New York City. It is situated on the east side of the Arthur Kill, at the entrance to Newark Bay, just north of the Goethals Bridge and Arthur Kill Vertical Lift Bridge. NY Waterway, or New York Waterway, is a private transportation company running ferry and bus service in the Port of New York and New Jersey and in the Hudson Valley. While operations and much marketing come under the NY Waterway logo, the company works with other private companies and in public-private partnership with agencies such as the Port Authority of New York and New Jersey, New Jersey Transit, New York City Department of Transportation, and Metropolitan Transportation Authority, to provide service and maintain docking facilities. The transportation system of New York City is a network of complex infrastructural systems. New York City, being the most populous city in the United States, has a transportation system which includes one of the largest subway systems in the world; the world's first mechanically ventilated vehicular tunnel; and an aerial tramway. New York City's airport system, which includes John F. Kennedy International Airport, LaGuardia Airport, Newark Liberty International Airport, Stewart Airport and a few smaller facilities, is one of the largest in the world. New York City is also home to an extensive bus system in each of the five boroughs, and numerous taxis throughout the city. New York New Jersey Rail, LLC is a switching and terminal railroad that operates the only car float operation across Upper New York Bay between Jersey City, New Jersey and Brooklyn, New York. Since mid-November 2008, it has been owned by the Port Authority of New York and New Jersey, which acquired it for about $16 million as a step in a process that might see a Cross-Harbor Rail Tunnel completed. The Port of New York and New Jersey is the port district of the New York-Newark metropolitan area, encompassing the region within approximately a 25-mile (40 km) radius of the Statue of Liberty National Monument. 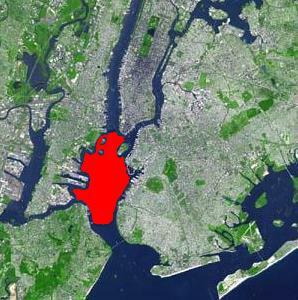 It includes the system of navigable waterways in the New York–New Jersey Harbor Estuary, which runs along 650 miles (1,050 km) of shoreline in the vicinity of New York City and northeastern New Jersey, as well as the region's airports and supporting rail and roadway distribution networks. Considered one of the largest natural harbors in the world, the port is by tonnage the third largest in the United States and the busiest on the East Coast. Liberty Water Taxi is a water taxi service based at Liberty Landing Marina in Jersey City, New Jersey, United States offering service between Liberty State Park in Jersey City, Warren Street in Paulus Hook, Jersey City and the World Financial Center in Battery Park City, Manhattan. It is one of several private operators of ferries, sightseeing boats, and water taxis in the Port of New York and New Jersey. The Hudson Waterfront is an urban area of northeastern New Jersey along the lower reaches of the Hudson River, the Upper New York Bay and the Kill van Kull. 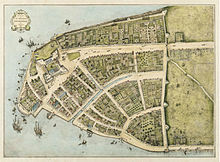 Though the term can specifically mean the shoreline, it often used to mean the contiguous urban area between the Bayonne Bridge and the George Washington Bridge that is approximately 19 miles (31 km) long. Historically, the region has been known as Bergen Neck, the lower peninsula, and Bergen Hill, lower Hudson Palisades. It has sometimes been called the Gold Coast. The West Midtown Ferry Terminal is a passenger bus and ferry terminal serving ferries along the Hudson River in New York City and northeastern New Jersey. It is located at Piers 78 and 79 in Hudson River Park adjacent to the West Side Highway at West 39th Street in Midtown Manhattan. The municipally-owned facility opened in 2005 as multi-user terminal to accommodate an increasing demand for ferry service in the Port of New York and New Jersey and to provide ferry slips for short haul crossings, water taxis, and high-speed long distance service. Built largely with public funds the West Midtown became upon its opening one of the principal terminals used by the private NY Waterway-operated routes to Jersey City, Hoboken, Weehawken, and Edgewater. The Battery Park City Ferry Terminal is a passenger ferry terminal in Battery Park City, Manhattan, serving ferries along the Hudson River in New York City and northeastern New Jersey. It provides slips to ferries, water taxis, and sightseeing boats in the Port of New York and New Jersey. The floating dock is moored at the foot of Vesey Street. The tugboat is a New York City icon. Once all steam powered, they soon became iconic, starting with the first hull, the paddler tug Rufus W. King of 1828. From the start of railroading in America through the first half of the 20th century, New York City and Long Island were major areas for rail freight transportation. However, their relative isolation from the mainland United States has always posed problems for rail traffic. Numerous factors over the late 20th century have caused further declines in freight rail traffic. Efforts to reverse this trend are ongoing, but have met with limited success. ExpressRail is a rail network supporting intermodal freight transport at the major container terminals of the Port of New York and New Jersey. The development of dockside trackage and railyards for transloading has been overseen by the Port Authority of New York and New Jersey which works in partnership with other public and private stakeholders. As of 2019, four ExpressRail terminals were in operation. The North Shore Branch is an abandoned branch of the Staten Island Railway in New York City, which operated along Staten Island's North Shore from Saint George to Port Ivory. The line continues into New Jersey via the Arthur Kill Vertical Lift Bridge to Cranford Junction.